For this month’s dinner, we take up Strider on his offer and imagine what sort of a meal a ranger could have created in the wild at the best of times. 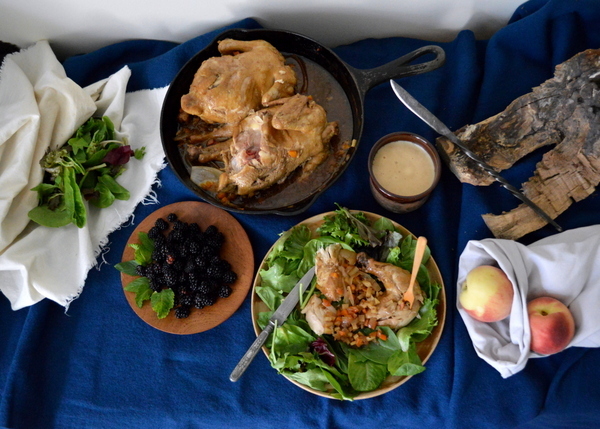 This is what Strider might have cooked up for a party of hungry Hobbits if they hadn’t been running for their lives from ringwraiths: pan-braised game hens with root vegetables on a bed of green leaf and herb salad with fresh blackberries for dessert. Cooking would’ve been done with a cast iron spider, and light-weight wooden plates and small utensils wouldn’t add too much to the burden. 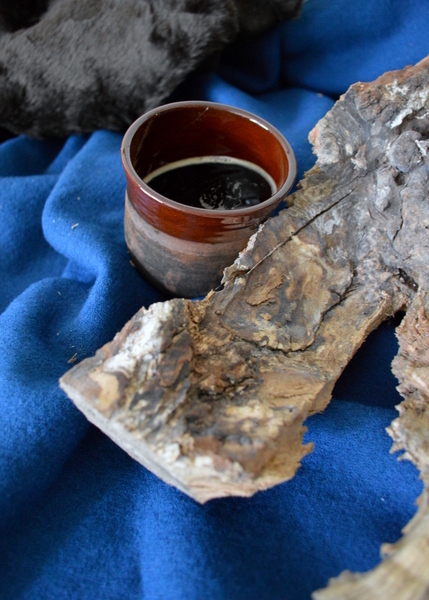 Small pieces of fabric and sacks provide storage, and a rough piece of firewood functions as a makeshift stool or table. Everything is laid on rich, deep blue wool blend that nods towards Aragorn’s high status as the heir of Elendil.